We are throwing this just in time for those winter gusts and/or trips abroad. We have noticed quite a bit of a down looping this summer and this is a fairly simple add-on. The move opens up a plethora of possibilities down with super power up. It can deliver some serious arching height and looks great off a wave and is a real crowd pleaser when thrown to blind. The kite downloops when it is sent with the direction of travel by being somewhat aggressive on the front hand side of the bar. It is best to start with the kite at 12 o’clock position. An S-BEND is the most effective way of completing a pop forward rotation when powered up. The primary difference between this and a standard front loop is the take-off. When learning the front loop, we usually throw our head and front shoulder down towards the water, bending and folding in the process as if we were role-playing. Because we have sent the kite, it gives us the necessary lift. Like many moves, your first attempts at this are best when you are not clinging onto your bar. Larger kites will give you more lift and time; smaller kites will give turn more quickly, so middle of the road relative to your weight would be ideal. The key to down looping is the timing, more precisely going early. The surfer carves the kite and starts to move forward. In anticipation, the surfer has compressed his legs to get ready for the launch. The surfer is not waiting to get ripped off the water by the kite, but instead explodes upwards as soon as he feels the kite begins to pull. Up to this phase the surfer could also be going for a straight down loop. (The only difference being that as the rider jumps, he will look over his hands towards the kite for balance and prepare for a downwind landing). As the kite starts to pull, the surfer stamps down on the back leg and throws him upwards, literally jumping into the air. To initiate the rotation, the surfer has thrown his trailing right shoulder up. The kite is now generating a fair amount of pull as it turns good top to toe stretch. This is real commitment time, just hold on and enjoy your flight. The kite continues its journey and the yank will in fact pull the surfer around the rest of his rotation. The surfer’s only effort is to twist his head and search for the landing strip. 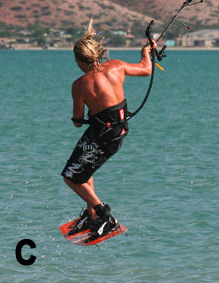 Once this kitesurfer sees the water, the rest of the body follows suit, the completion of the S-BEND bringing his feet back underneath. If at this stage you feel you still have some height. It is time to let go with the original back right back hand to help slow your rotation and balance the landing. On touchdown, the surfer absorbs the impact with soft knees and once they have recovered, the surfer grabs the bar again with the back hand, sails on downwind to hook back in and giggles blissfully. Ideally, as you land you’ll see your kite once again diving down towards the sea. That means that you can grab the back of the bar and pull the kite out of its dive posture as you hook in. There are 2 Reasons why the kite does this. First – If you edge for your country and wait for the kite to physically rip you off the water, the kite will almost have finished a complete loop before you get airborne. To correct this, just think about going early. By this we mean swap your hands, carve and jump up. You should then get the pull in the air, a slower rotation, more height and a sweeter landing. Second – You are riding in a tiny kite. If you are having trouble finishing your rotation, try starting with the kite higher. It is fairly unnatural to stick the kite at 12 o’clock. 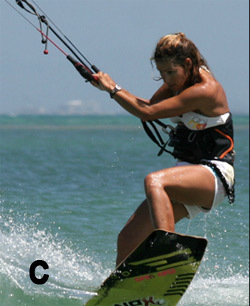 More power in the kite should give you a slower rotation but a more preferred gun blazing downwind strike. Once you are confident, try using more power. That is to say do not pull the trim strap as far down as you usually would for and unhooked move. This is a stunning move for those that really like ballsy tricks where it is all about setting up everything perfectly. Before going through the move, it is encouraged to simply “go earlier” and “pull of your life”, stepping it up a gear so you get focused on the move. This trick is all about commitment, once you have set the wheel in motion, you are a whole lot better off going the nine yards than trying to make your way out. The good news, however, is that you can build up into this trick and therefore save yourself onto any unnecessary spankings. To give yourself a good chance of nailing the front loop kiteloop, there are definitely a few things that you should be able to do. Due to the fact that you’ll be looping forwards whilst the kite loops backwards, you will perform this move blind, as all the action will be happening behind you. The base for learning this move is a front loop transition, so this needs to be solid. On top of that, this shouldn’t be the first kiteloop you are attempting, as you really need to have your fast and sometimes hard and difficult landings down. To get your head around the idea of what is going on we will start at the front loop transition. 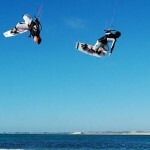 Normally as you exit the transition, you should dive the kite hard. This pulls you out of your rotation and encourages you to land downwind. Essentially this results in the kite diving straight down through the window, and it usually takes a fair old tug to stop the kite from hitting the water. It is then when you carve back onto your edge and the kite rising which takes you back in the other direction. Once you done a few front loop transition and feel comfortable with the approach. As you exit the move, just as your board touches down pointing off wind, rather than pulling the kite back up, pull harder with your back hand so that the kite loops under itself. This way you will follow the pull of the kite and carve out in the same direction that you went into the move, so no change in direction. Pic A – Shows the surfer just before the take-off. If you look at her hand and the bar, you can see that the surfer has sent the kite back, but jump is not that aggressive. There are two reasons for this. First, you do not want to be jumping high because this move is all about commitment, make it easier to commit. Once you are three meters up, you may find the thought of looping your kite-less appeal. Second, you do not want your kite to go too far behind you. The further back it goes, the lower it will loop, which in turn means a heavier landing. Apart from the gentler sending, much as transition, the surfer is still carving hard against the kite off his back foot and dropping his weight against the upward pull of the kite. 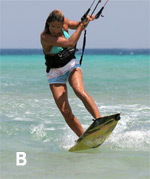 Pic B – The surfer is most definitely rotating into a front loop. You can see how far his front shoulder dipped still down from the take-off and that the surfer has already brought his legs up for balance and speed of rotation. However, the really exciting part of this picture is the bar. His back hand has slid all the away to the end of the bar, so the surfer can get decent purchase to crank the bar in and get the kite turning into its loop. It is also worth noting that the surfer has not pulled his front hand in. It is very easy to pull hard on the back hand and subconsciously pull down on the front hand too. Just keep the bar sheeted in with the front hand and let the back hand/arm do all the work. When learning this move, the harder you pull on the bar and the quicker the kite turns the gentler the kiteloop will be. From here there is no way back. Pic C – To be in control of the kite and make sure it loops, you need to have tension on the lines. Here you can see that the surfer has the bar sheeted in, so the kite will react. Also by making a physical effort to keep the bar sheeted in, you are far less likely letting the bar slide out as the power comes on, which would unfortunately stop the kite from turning. An added bonus is that, as the looping kite pulls, you will feel it through your arms, not just your harness and thus, you will able to keep your balance more easily. 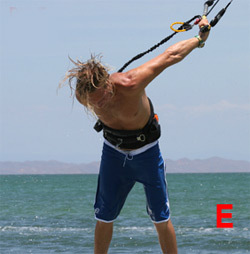 Pic D – The surfer has been pulled around his front loop by the looping kite and the pull of his harness hook. As long as the kite loops, you will always finish your rotation. Even though she is around, if you look closely, the surfer still has the bar pulled right in with both hands thus giving it plenty of hand. It is tempting to ease off because it will feel like the kite has turned further than it really has, but if you do, the best end is the splashing down in like a doggy transition. The surfer is also looking where to go. As a reference, try to look slightly behind of the downwind, this way you can land with speed and then carve out, and if you have looped the kite too fast, you can carve back from where you came, having turned the whole thing into a front loop kiteloop transition. 1. Approaching with speed, the surfer has a good check to see the room to get pulled back and downwind by looping the kite without risking anybody else. The surfer got a bit of water under too. The surfer sends the kite back positively, keeping the bar on the sweet spot. 2-3. As the front loop goes, the surfer throws himself forward and down as the kite lifts him up off the water. At this point the surfer levels the bar and sheets in. 4. As the surfer starts to rotate, sliding the back hand down the bar and pulls his knees up and then pulls hard on his back hand to get the kite looping. 5-7. To increase his chance of success, the surfer keeps pulling on his back hand to make sure that the kite turns all the way and also keeps the bar pulled in, so that there is tension on the lines and the kite does what the surfer expects. 8. So far all through the rotation, the surfer has been looking over his back shoulder. As the surfer gets most of the way around the loop and focuses on where to land. 9. 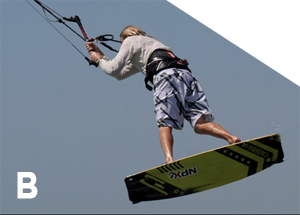 With the kite powering around its loop, it spins the surfer around so that his harness hook is pointing at where the pull is coming, slightly behind of downwind. The surfer keeps the bar sheeted in and keeps turning the kite with his back hand. 10. This is the moment of most power as the kite starts to climb back up. The surfer keeps his knees up thus, pulling the bar with his hands to keep the balance. 11. The surfer has survived the loop and just need to stick the landing. With the power of the kite decreasing, the surfer starts to drop. This is his cue to let his feet drop beneath. 12. As his feet drops, the surfer aims for a downwind landing, concentrating on keeping his weight over the board and not to one side or the other. 13. The surfer lands tail first but onto a level board, so the surfer can soak up the speed. Once steady, the surfer carves back onto his edge, with a great relief plus the applause. Keep bar in to sweet spot on take-off. Move back hand down the bar. Start kiteloop as soon as you feel you are rotating under the kite. Keep both hands on the bar and keep the bar in. Look to land downwind over the board. To learn this move you need timing and technique because the air pass on this trick is dependent on it, not on brute strength, it is within reach. But, i if you dangle your thrusting hips, it will serve you proud! Also, we will look at this trick as a stepping stone towards the much cooler named KGB. A good starting place is to go back to the popped back loop, as you’ll need to give yourself time, some extra height and changing of rotation in preparation of throwing in a cheeky air pass. 1. Where you take-off is where you land (downwind to downwind). So bear off the wind a lot before taking off. This way you will do more of the back loop in the air than on the water, which in turn will give you time to prepare for the pass and reward yourself with and easier stick downwind landing. 2. Mind your head. If you look around over your front shoulder as you take-off, you will spin much faster, so aim to keep your head square with your shoulders and look through the gap between your arms. Not only will this slow down your rotation, it will also make your direction change easy against the flow when you throw the pass. As far as your rotation is concerned, you will need to get more inversion. This does not mean you need to be upside down, but if you look at pic A you can see how the surfer is in a horizontal position and has his knees up above his body. This will stop his body dropping away from the bar when the surfer goes for the pass. The simplest way to get into this position is to lean your body back over the tail of the board as you pop, which will lay you onto your back in the air. As soon as you leave the water, make huge effort on bringing your knees up. Try to keep your kite around 11 or 1 o’clock, as it will help you with the rotation, body position. It will give you something to physically pull against when you go for the pass much higher and you will be dangling under the kite, and also you will need that extra energy for that. 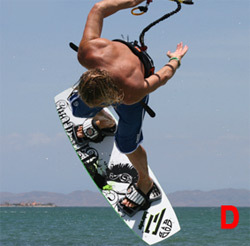 Pic B – we can see that the surfer seems much inverted compared to the previous. However, if you look closely, the only difference is that his feet are higher and his legs are extending, this means that the surfer is going for it. From practicing this trick, you should know the moment when you’re tucked up the bar is close to you and you start to drop down as you complete the back loop. You need to go for the pass just before the dropping time. To give yourself more “float”, kick your legs up just before you throw the blind twist. With the board up, momentarily no force will pull you down. You can see in this picture that the surfer comes further around the back loop and his hips are moving around towards the bar. Once you have kicked your legs up and the board away, you’re throwing yourself to a blond, just from a rather familiar position. The actions are the same; you will pull hard on the bar with both hands and bring it towards your front hip. Pic C – You can see that the surfer has pulled, released the bar with his back hand, and is now throwing his head, hips and shoulders around. This is really where the kite position is so important. If the kite is too high, there will be nothing to pull against, and you’ll find it hard to get the blind rotation. Pic D – You can see how the surfer twists his wrist and thumb down and around, which enables his body to twist around further. Commitment is the key here. It would be very easy to give up and let go but you must reach around with your free hand. If the kite is sufficiently low, your pull before throwing should result in a tiny bit of slack as you drop and therefore making the pass easier. Pic E –If you have timed it right, the bar will come to you, hopefully before your board touches down. Just let the kite pull our arm around and try to follow with your head for a balanced landing. Pic F – Voila! When you watch someone doing a trick like this and it looks often effortless, take in mind that you need a complete conviction and your best kite face. 1. With enough power in the kite and speed under the board to pop against, the surfer has unhooked, pointed off the wind and is now carving hard into his pop. His bum is down and front leg is extended for a decent edge whilst his back leg is slightly bent ready to explode for the take-off. 2. The board turns up and it is time to extend his back leg as the surfer leans back over the tail to initiate a more horizontal back loop. His head is looking forward to where to go for the rotation to slow down. 3. As soon as his board leaves the water, the surfer starts to bring his knees up towards his body. He is still looking straight through his bent arms. 4. Still going up and around, the surfer isn’t looking over his shoulder, but lets the back rotation bring his hips around towards the bar. 5. If you were to look at the bar, it has completed the back loop. However, the surfer will always be following. From practice, he feels the rotation around onto the bar, so it is time to go for it. The surfer kicks his legs up, pulls the bar hard into his front hip, thrusts his front hip up and around and throws the pass. Because the kite is low enough, the surfer has something to pull against to kick-start his blind rotation before letting go with his back hand. 6. Turning the body, the surfer twists the bar around behind his back, enabling him to turn even further and position the bar so that it is ready for his free hand as it reaches around. 7. As if by magic, the bar is where it should be and the surfer grabs it with his free hand, whilst simultaneously releasing his other hand. 8. Dropping down, the surfer lets his arms untwist and lowers his legs in preparation for the landing. 9-10. As the surfer comes in and looks around as to where to go he reaches up for the bar with free hand. Both these movements will help balance the landing. Then regains control of the kite with both hands on the bar and sails on smugly. This trick is a fairly funky move in in its own right, although you do not get to see them as much. 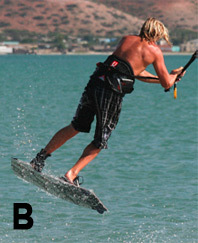 Most riders skip it in preference of going straight into the back move, and once they land, then they are unlikely to go back to the wrapped version. However, if you’re not one of the better riders in the country, this is a very useful stepping stone which will satisfy and build a consistency for more progressive moves. The beauty of the back to wrapped is that the momentum of a slightly over rotated back loop can carry you around to wrapped. Without stating the obvious, you will need a controlled unhooked back loop to toe side at the very least. If you are already popping to blind, then this will help. Even though blind is very different, having a natural bar pass will make life easier. In many pass tricks, the difficulty is in slowing your rotation down. In this one you need to speed it up. 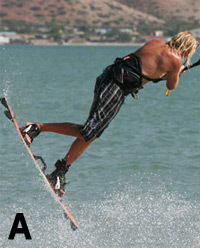 The simplest way to do this is to carve your way up into wind before popping off your back leg. This late take-off will spin you faster and will send you into a second rotation, at least to toe side, without you having a moment’s thought. The only disadvantage is that you won’t have much time to prepare for the rest. When you carve into the wind it is more likely that your arms will be pulled out by the power in the kite. As soon as you leave the water, you need to get your elbows tucked into your side. If you can get them in, your hips will roll onto your hands, which keeps the bar in close and enables you to keep your balance and pass. You need to rock your back knee in order for you to stay with the move. As you rotate with elbows pulled in, you will need to lift both knees. This will not only speedup your rotation but will also place your back knee high enough so you can kick it through. This knee force will accelerate your second rotation and will take you past the landing toe side. Remember to twist your wrist once you release the bar with your front hand as you will be able to turn your shoulders further. Once you get the hang of things, you can even pull your hands in and steer the kite down as you push through. This will bring everything together at your hips and helps keep the kite lower for landing, preventing it from pulling you out of position and off balance. It is all good when you are through with all that leads, but it means nothing if you are not ready for the touchdown. To stick this you will need to get around to downwind preferably a bit further. To increase your chances you should try and land tail first, as the back of the board will then pivot you around a touch further. To make this possible, get your weight on the ball of your feet, not your heels, otherwise you will keep slamming. Finally, keep looking around so your body will turn to face your intended direction of travel and make the pass behind you considerably easier. pic 1 – The surfer has checked for space, turned off the wind and unhooked, hands on the center of the bar with his weight over his back foot. pic 2 – The surfer carves hard into the wind, dropping his weight low and resisting the power by driving against both heels, making sure to take the weight of the kite on both hands evenly to stop any unwanted kite movement. pic 3 – The surfer has carved further into the wind than a normal pop would do. His head is turned to look right upwind over his shoulder. Also, as the board turns up into the wind and under the surfer, there is a little resistance from the edge so pulling his elbows back in has been started already. pic 4 – When the surfer feels that there is less pressure on the bar and on her legs, the surfer quickly pops. This means that the explosion off her back leg will accelerate his spin. You can see that the surfer extends his back leg as it pushes him around as opposed to up into a huge pop. The timing here is very important, If you leave it too long you won’t even get enough height to complete a back loop. pic 5 – Because the turning off so far on the water, the surfer is already three quarters around his back loop as soon as the rotation is in process. His aim is to keep his elbows in and bring his knees up making him smaller because this will help keep momentum going for the rotation to wrapped, and by lifting his knees, the weight of the board will not pull him down away from the bar too soon. pic 6 – Coming around the back loop, the surfer’s trailing knee is up near the bar and his hands. As he continues to rotate, his hips will follow his knees and roll towards his hands. Once you have tried it enough to give your brain some time, this would be a good moment to jerk our hands in and even steer the kite down as you do so. At this point, the surfer must keep looking over his shoulder and around into the next rotation. If he were to focus on where to land, it will slow his spin and prevent him from getting around. pic 7 – A split second before this shot, the surfer have really pushed his back leg and knee just as his hips rolled towards his hands. So he have done it with both hands on the bar to keep the kite from going up and allowing him to get hands and hips as close as possible. As the knee comes through, the surfer lets go with her front hand and keeps looking over his shoulder. pic 8 – As the surfer turns, the wrist is twisted and the thumb pointed towards the small of his back. This enables him to turn further. He lands back foot first with weight on the ball of his feet. The board will pivot further around here without the surfer catching his heel side edge. Carve hard and long, lead with head. Both hands to hips before releasing. In continuation of out front loop fest, we thought it high time to introduce and familiarize the baby brother of the much respected S-bend, the Popped Unhooked Front Loop. Not only does this move dazzle, but also it is a foundation for a whole other world of kiting techniques that may or may not intrigue you. In addition to that, all this unhooked malarkey (if you’re tempted) is just as well practiced on those underpowered summer days, so give it a shot. Popping, front looping and a basic unhooked Raley would be a small requirements, along with a modern safety system that lets you both spin and unhook without risking any third party members of the public or kite surfing community. To help you learn all the important ingredients of an unhooked popped front, we’ll take another look at unhooking, a little glance at popping and way up the differences of popped front compared to a sent front loop. The simplest way to make unhooking controllable is to understand how your kite is trim, thus your bar position will effect what’s going on. For unhooking, it is vital that you use the strap to trim your bar’s sweet spot so that it rests just above the chicken loop. This way, the bar will feel light and the kite will drift forward, allowing you to be powered up yet in control. Every kite is unique, but it’s more time consuming getting it right. If you don’t trim the sweet spot down, your kite will most likely flare, pulling you off downwind, falling out of the sky in the calms and making kite surfing in general fairly unkind. Pics 1 & 2. You can see that the surfer is sailing along hands centered with bar trimmed down, flattens the board off by abruptly standing up and almost carves, putting weight over the rear foot. This sudden change in direction towards the kite releases the tension off the lines. Pic 3. With the tension gone, the surfer pulls the bar in and pushes it down to let the chicken loop slide out from the hook. Without looking down, as this would prevent the hips to move back and make unhooking difficult. Pic 4. As the chicken loops drops out, the surfer must start to carve into pop before losing speed. Head positioned forward in direction as to where the surfer wishes to go, moves weight and hips right back over the rear foot and straightens the front leg, while dropping upwind off the board to get it back on an edge. Pics 5 & 6. The surfer tries to maintain shoulders, back and front leg straight when carving hard against the pull of the kite. The goal is to explode up off the rear leg once it gets unstable, must also try and maintain equal pressure on both hands, as it is easy to pull on the back hand and hurl the kite up. It is essential that you provide a good pop, as this will give you enough time to complete your spin. Your body position in the last stage of the carve will either offer you the chance to explode up or let you be dragged low over the edge which you do not want. In the picture to left, you can see that just before take-off, the surfer positioned the buttocks low to the water, shoulders have not been pulled forward the hips, front leg is extended to keep the edge and push the weight back over the tail of the board, rear leg is flexed in preparation to explode and is looking forward, which will prevent carving too far into the wind. To support this, don’t park your kite at a 45 degree angle, that’s for some time in the future. You need to catch a comfortable height where you are comfortable edging like this, without the kite providing too much lift, but which will also give you a tad of extra bounce off the water. 11 or 1 o’clock would be a decent place to begin. Your pop is going to spring you up off the water, and thus your front rotation needs to compliment this. In a standard front loop when the kite is utilized for height, you’re more than likely to throw your head and shoulders down and around to start rotating. This works because the kite gives you an up force. When popping, if you throw your head down towards your front shoulder, you’ll be neutralizing all the good work you’ve done getting up off the water by forcing your body weight down, and that would be counterproductive. Instead, you need to lift your chin and turn to look up and over the back shoulder as your rear leg extends, see picture on your left hand. To some, this does not seem to be essentially wise, as you are straightening your back and turning it towards possible impact, whereas the original front loop was a safe roll as if you were crumpling up to break a fall. The second difference is your body can stay extended in a popped front loop, whereas in the jumped version, you are trying make yourself a bit compressed. Your head is the key to completing this rotation. Half way around you are in prone position, because the kite will be pulling you forward, you will not be able to force your hips, legs and board around in front of you, while your legs are hanging behind and upwind of you. To finish your spin, you’ll need to look over your shoulder at where you wish to go and then push your hands around to follow. By doing this, your upper body will be facing downwind and the rest will have to follow. There is a tendency to pull on the back hand as you carve against the kite. This is more than normal, but it should be avoided. However, if you do find your kite drifting up, give it up a pull on your front hand and a push on the other hand as you come around your rotation. If this still doesn’t help, try pulling on your front hand as you take off. Park the kite in 11 o’clock. Carve hard upwind for maximum pop. Put your weight low and towards the back on the board. Extend your front leg. Ride against the power of the kite whilst looking forward. As soon as you feel your shoulders being pulled forward over your hips explode off the water by rapidly extending your back leg. Your aim is to spring up and turn your head towards your right arm to initiate the rotation. As the kite pulls you forward continue the rotation and keep looking rounds towards your back elbow. You are now half way through this trick. You´re facing upwind and are fully powered so you better complete your rotation. Try to get a glimpse on where you´re going by spotting a potential landing. As your head comes around force your bar and hands around too. With your head and shoulders facing forward, the rest of your body follows and you can start dropping down your legs down under you. Land the tail first on preferable flat water, slightly off the wind. Soften the knees to absorb the landing and keep looking forward, not down in the water. Catch an eye on the kite to make sure that it´s not diving into the water, correct if necessary. Then keep heading towards the kite on a flat board. Time to take a hand off and hook back in. Don’t take too much speed into this technique at first, as it’ll feel like you’re in a rush, yet alone rotate and land. As you develop, you should try and start with the kite a tad lower and keep it still. As you progress with more power, focus on popping up into the Raley first and then start your rotation. If your kite is starting to misbehave and is hurling up away, try moving your back hand to the center of the bar with the chicken loop line running between your first two fingers. Popping from a toe side and landing in a wrapped is a great start to wrapped if you haven’t tried it before, and if you can already manage a shifty or more to wrapped, then this should be a doodle and a surefire way of adding extra style points to any move you land in toe side. For those of you who have never tried a wrapped, it is releasing the front hand and rotating away from the bar so that you can reach around behind you and land on heel side with your arm in a self-induced arm lock. If you can go blind one way, imagine going the other way but still releasing with the same hand and turning the exact same way. In pic A, you can see that the surfer is almost carving downwind away from his toe side edge. This is very sudden change of direction that does two things. First, it allows you to keep your speed for a moment even without pulling the kite, which means your board will still be planning; therefore you will be able to pop without it sticking. Second, by suddenly turning towards your kite, the lines will slacken and the bar will be light in your hands so you can keep it low and close. In pic B – Just as the surfer is about to pop, you can see that the bar is in close. With the slack in the lines the surfer can bend his arms and make sure the bar will close to him all the way around his 180 degree spin. You can also see that the kite is relatively low, say around the 45 degree mark. With the kite here it is less likely to pull the bar up and away from you. Also, ( as you’ll be releasing with your front hands) if the kite does move, it will go up, so starting with a lower tad is a good option. If you are popping off flat water, you will need to let go with your front hand as you heave up. As we have already mentioned, you can throw this pop whenever you come fast in your toes from another move. However, when you are trying this for the first time as a pop from toe side, your approach is pretty important because you will need speed. The simplest way to maintain speed is to unhook whilst riding heel side as you will have a better unhooked riding position. 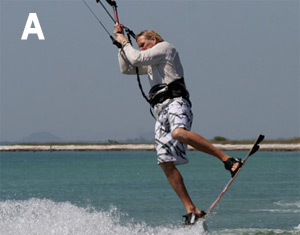 Then, you can slide the back of the board straight downwind and you are ready to pop from a very off the wind toe side. However, once you get the hang of it, you could unhook from toe side or just before you pop. 1 – Having approached with good speed and his kite positioned at about 10:30, the surfer has unhooked and the spun around to a very downwind toe side chasing the kite. Getting ready to pop the surfer has rocked his weight back over his trailing foot and flexed his back knee. The surfer got his bar in close to his body and is ready to spring. 2 – The surfer stamps down hard on his back foot and extends his body upwards. At the same time the surfer releases his front hand enabling him to stand over the board for a balanced spin. 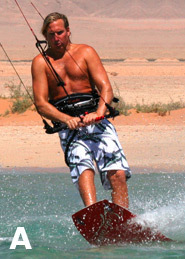 3 – AS the board rises, the surfer lifts his legs and starts his rotation by turning his head and shoulders down and away from the kite. 4 – The surfer twists his wrist and turns his palm up behind his back, which helps him turn his shoulders further still. At the same time the surfer pushes his left foot through to get the board in front of him. 5 - On landing, the surfer makes sure that the bar is twisted all the way around and ready to be grabbed. 6 – The surfer reaches with this free left hand and grabs the bar. 7 – then releases his right hand. 8-9 – The surfer continues to turn his head and looks up towards the bar and gets both hands back on the bar. 10 – Sail away, hook back in and then try it from a railey to toe side. This is a cracking move, which look phenomenal, feels amazing and is actually easy to nail consistently once you have got it. So what is Wrapped? If you haven’t contemplated what landing wrapped is, try visualizing that you are about to land toeside but you continue rotating and turn the board for you to be able to rotate another 180 degree to land heelside whilst releasing your front hand. The effect is that you’ll land with your back hand twisted up in half behind you. Pic A – We can see how the surfer used his back foot and the back board. The front foot is lower than his back foot and his back foot is further upwind than his front foot. In fact, the shifty has been lifted at the end of the board whilst his extended front leg has pretty much left the nose of the board. Pic B – As soon as the surfer stops holding his shifty position, the gravity takes over. His back foot and the weight of the back board drop down and accelerate as they go, creating some high and useful momentum. Once again the static front, which isn’t falling, acts as a pivot point so the back leg starts to swing around for toeside landing. Pic C– This picture shows the result of a tasty amount of rotation which should be an easy task for you to get around the wrapped. The only thing left to do then is to release your front hand, twist your wrist around and turn your head. Do not let go as you aim to land in a wrapped position. 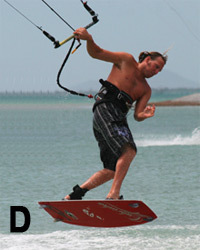 Pic D – Shows that the kite drifted up and the surfer does this move with his hand centered on the bar with the chicken loop line in between his first two fingers. 1. As per usual, the surfer has come off the wind to unhook and set himself up for take-off. The surfer pushes the board out in front by extending his front leg which gets his weight over the back foot. The more off the wind the surfer goes the less carve to far up into the wind and get a raley take-off. 2. The surfer gets back onto his edge by dropping his weight to upwind and carves the board against the pull of the kite. 3. With his weight over his back foot, the surfer allows him to be pulled up and explodes off his back foot. Immediately leans his head over his back arm and keeps his front leg extended. Because the kite isn’t too high, his arms do not get pulled up over his head. 4, As the board leaves the water, the surfer keeps his front leg locked and starts to swing his back leg upwind. 5. With the board pivoting around his front leg, the surfer keeps his weight forward, holding the nose of the board down and lifts his back foot up towards his backside. 6-7. Once the surfer feels that landing is near, on the way down the surfer release his shifty and let the board swing down. At the same time pulling the bar towards his back knew as savagely hard as possible and kicks his back knee towards the bar. This gets the rotation to wrapped underway. 1. Having pulled the bar toward his knee and kicked his knee towards the bar, the surfer is spinning fairly and rapidly. The surfer twists his wrist as the turn is on for the preparation of the bar, which also allows him to turn his shoulders further. His head is turning to look where he is going and his right knee is still driving around. 2. Having turned, the surfer’s main aim is to land on a flattish board and hold on to the bar. To do this, the surfer rotated around and got his hips centered between his feet. This will give him a stable platform to land on and give him the balance to pass the bar. You can also see that his palm has turned all the way up. This means that the bar is ready and waiting for the other hand, and it also stops the shoulder from getting pulled. 3. With the bar twisted and waiting in place, the surfer reaches up with his other hand and grabs the bar from underneath with his free hand and palm up. The surfer also starts to stand tall. 4. Now that the surfer is upright, the surfer quickly releases the bar and cunningly gets out of the wrapped arm lock. 5-6. The surfer turns his head and looks where to go, reaches forward to get two hands back on the bar and hook back in. The unhooked downloop is a satisfying piece that unluckily does not get enough airtime these days. When it is at home this move is performed with a pop at the same time the kite loops in a forward direction, which unavoidably will pull you forward into a raley position. 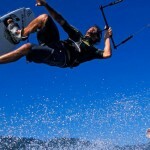 As the pull from the kite comes from your front, it is not that too aggressive, and it is another unhooked move that can be easily performed when you surf at an agitated water. Finally, this trick is the originator for a downloop S-Bend. In pure timing terms you need to be popping early. You should be able to pop from the speed that you take into the move. This way you do not need to let the kite loop move to give power to perform the pop. The result of this is that you will be going up as the kite starts to go around, simply meant that you will get more land and height as the kite finishes its loop move. The longer you wait the lower the kite you’ll fly. This will also end up with the kite starting another rotation before you land. Your first concern is the position of your kite. Ideally you will have your kite pretty much at 12 o’clock to start this move. It is good, but you need to unhook too. This means that your approach needs to work for you. 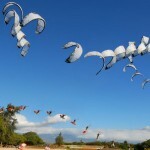 With your kite high, the problems of slowing down and not being able to unhook are lurking in the wings. On your approach you will need to drift the kite up at the same time edging hard and then at the last minute bear away loads to slacken the lines off and then go to unhook. Your body position here for unhooking is crucial, so make sure that you push your hips up and shoulders back, otherwise the chicken loop will not slip out easily. Next you need to get your hands sorted. You need to release your back hand and reach forward to grab the bar just underneath your front hand in a fish pole grip during the redirection phase. There is no relevance to whether you are right or left handed. The important thing only is that your front hand steadily stays up against the center line and the released back hand grabs in close to it as possible. If you have just lathered up with some factor 50, this could prove a tad tricky. The slick movement to one side of the bar will get the kite turning sharpish into a downloop. You should be well aware by now of the need for a decent edge to pop-off. If you enter with the correct body position, it will be easy enough to get onto your edge quickly. Your shoulders should be in a back position and your hips forward. Even more importantly is that you need to extend your front leg, so your hips are over your back foot and aim upwind while your hips and shoulders twist. This will allow you to drop your bum low to the water and get into a solid craving position in a quick time. Notice how the surfer has already started to drop into carving after the back hand is released. By doing this, the surfer will have a perfect phase to pop off from the edge before the kite gets too far into its downloop. The surfer will explode up off his back leg by suddenly straightening it, kicking it down onto the heel of his back foot to pop perfectly. Once you pop up into the air your objective is to follow the pull of the kite. By doing this you will keep your balance and will give you an enough inclination for the landing. The simplest way to go with the kite’s pulling force is to watch it. You can see that the surfer is being pulled through the air by his downlooping kite. Head is in line with the bar, which is pointing at the kite. In a powered downloop, your feet might flick up slightly behind you. As long as you look at the kite, it will not twist you. Also by looking up at the kite, the surfer’s head is lifted. This will make it easier for his feet and board to drop underneath. If you feel the need to take off a hand off for balance, then it must be your back hand. As we mentioned keeping your head up, allow your body to fall into a normal vertical position. If you can keep your arms, or front arm bent, the pull will bring your leading hip forward and set you up for a pleasant downwind landing. The surfer is upright over his board. This gives him the option of going either way depending on where the kite is going. When you first land a downloop, follow the kite downwind and watch it loop again. As you see it turn through the center of its rotation and is starting to come up, grab the back of the bar with the hand you swapped over. If you do not get the right timing, just grab the chicken loop and let go of the bar. At least the kite will flutter up and you can sort yourself out. Pic 1 – The surfer approaches with the kite around 11 o’clock and starts to drift the kite up with a sudden pull-away to allow the body to be pulled up over the board, flattening it and pushing the front foot towards the kite and leaning with the back foot with weight over. Pic 2 – The surfer forces his hips forward and up at the same time pulling down with both hands. Pic 3 – As the surfer pushes the bar away and the chicken loop out, the surfer starts to drop his bum and shoulders away from the kite and looks where to go and not at the kite. Pic 4 – The surfer swaps hands and starts to get back on the edge by driving his feet away. Pic 7 – The surfer pops up hard off his edge extending his back leg. 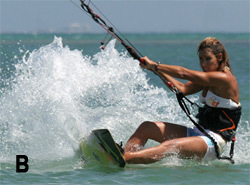 Pic 1 – As the surfer pops up the kite, pulling forward is the main goal with offering no resistance at all. Pic 2 & 3 – The surfer looks towards the kite to keep the balance all the way. Pic 4 – As the kite starts to rise again, it stops pulling and the surfer starts to drop down. Keeping the bar pulled in with bent elbows, this turns the surfer naturally to follow the kite. Pic 5 – With the head of the surfer up, the feet and the board drops under and releases the back hand for some added balance. Pic 6 – The surfer lands over the board, waits for the kite to rise, and then gets the other hand back on the bar. The Kite Loop to Wrapped is a desirable technique in its own right which demonstrates superior control and landing satisfaction. Though it is also a vital step to kite loop 3, surely, there are benefits in learning the wrapped version first. Firstly, you have more time to focus on the kite loop as the timing for the spin is a last minute thing. Rather than looking forward for the moment to spin, better to wait for it. Secondly, you don’t need much height so you can get away with less power which makes a more pleasant learning experience. Thirdly, as an outcome of both of the above, to succeed is all about technique and has nothing to do with aggressive force. Once you’ve got it, you can move onto the full 3 version a whole lot easier. If you are coming into this as a relatively new recruit to wrapped, it is recommended to practice on your shifty to wrapped first as this is the primary building block of a quick spin to wrapped. Whether you’ll be going for a kite loop with or without wrapped or a pass, what your kite does will affect your chances of success, and what your kite does is remarkably influenced by your approach and take off as you’ll be learning this technique with a fish pole grip, you have no way of controlling the speed at which your kite loops with your hands instead the rest of your body. Chances are, when you first attempted an unhooked kite loop, you changed your hands and the kite looped before you had time to think, dragging you off downwind vigorously and most likely splash you into the water. The simple reason for this is that you need to pop to get off the water and let the kite do the rest when you’re up. If you just edge hard, you put more tension on the lines and the kite moves fast. In Pic A, the surfer basically just eased off downwind with the kite at 12:00, unhooked and reached under and back with front hand to grab the back of the bar and popped up off the back leg right away. You can see how the surfer’s whole body from feet to shoulders is aimed upwards and not back against the pull of the kite. Because the kite is not breaking the surfer up off the water, maintaining the arms bent is easy and therefore keep the bar close. Because the surfer is no longer resisting against the kite, it will turn slower. And because the surfer has popped up, the kite will hurl up providing more height effortlessly. The longer you carve on the water, the more vigorous the break from the kite, the further back the kite loop and the lower he resultant jump. This will only be possible if you unhook with your front leg pushed out in front of you, your hips dropped right back over the rear foot and your shoulders back. From this state, you can swiftly carve and pop. We use the term shifty freely as we don’t want to get into any discussions about style. Let’s agree that in this case what we mean is the extension of the rear leg behind us. As with the shifty to wrapped by kicking your rear leg behind while in the air, you then can bring the knee up and through which will assist you to spin faster and further. For sure there are many surfers, who spin without extending their leg first, but we’re in the market of making this easier for all involved, and this absolutely helps. The other benefit to this position is that it allows you to use the “flick” of the kite. This being the point at which the kite tries to knock you off balance, usually by swinging your legs forward as the kite turns back. With the back leg extended, you can then pull the knee up towards you to regain your stability and hyphen up your rotation speed. In Pic B, you can see that the surfer kicked his rear leg and foot up behind as the kite pulls. As with the shifty to wrapped, the surfer didn’t let those arms extend, instead keeps the bar close. Looking at the image, you can see that there is almost a straight line running from his hands through his back knee to his rear foot. If you were watching the kite, it would just be turning through the bottom of its arc and is beginning to rise. More lower body work out here. It is all about getting your hips, legs and board to turn. Your upper body will follow your head but if you don’t get the lower half moving, it’s good as nothing. In Pic C, the surfer is dropping and feels that there is much less pull in the bar. This is the signal to start spinning and this is the advantage of learning to wrapped. In this image, there are two important things. Firstly, if you look at the surfer’s right foot, you can see how it is lifted off the footpad. This indicates just how vigorously the surfer has pulled his knee, foot and the rear of the board forward towards his hands. Because of the shifty, the surfer was able to do this. Secondly, look at the position of the left hand. It is almost wrapped around. This is because the surfer has not pulled the bar into his back hip, but rather has pulled the bar past the hip and down as if pulling a paddle along the side of the raft. So the hands have been drawn down towards where the rear foot was and the knee had been brought forward to get the board under the bar and the bar under the shoulders. Once you get the board under, you can then rotate with your head to get your upper body around on a vertical axis. If you rotated before the knee came through, the board would be left behind, and you would rotate off axis and be dragged off balance. Before you go for any wrapped landings, give yourself more allowance by knocking out a handful of unhooked kite loops first. Aim about taking off early, extending the rear leg and feeling the tension disappears as you drop. This way, you’ll get a sense for when you need to spin and also provides you the right amount of power and height. If you feel like you are overdoing it, it may not be the right day to try. Consider trimming your kite too. You want your kite to be looping circular, not to be turning around its wing tips. On the majority of kites, if you don’t trim them down enough to unhook, they will flare/reverse/halt. This will result in a tight wing tip axis and won’t give you the feeling that you need or much of a chance of succeeding. Defined and controlled is better than wild and unpredictable as you can build on it. 1. Have a good look around to make sure you have enough space. The surfer moves his kite up to 12 o’clock, pushing the board off the wind with a straight front leg unhooks with his shoulders still back. 2 & 3. After unhooking, you need to reach under and back with front hand to fish pole the bar, drops weight back and upwind. 5. ..and explodes up off the rear leg before the kite starts to pull. When you pop, you need to keep your arms bent and the bar in close. 6. As the kite loops back and down, it’ll pull you towards it. Kick the rear leg out behind and hold on tight. To help with balance, you can look over the bar towards the kite. 7. As the kite starts to rise, it stops pulling and you’ll start to drop as well. This is the perfect time to spin just as you feel the power. Pull arms in and down past the back hips hard and pull the rear leg in even harder. 8. Keep pulling on the bar, try to pull it past the hip and release only the front hand as your lower body and knee will come through. 9. With the lower body turning, start to turn your head and shoulders so that you can continue to spin far enough to land with the board pointing downwind. If you find that the kite drags you hard downwind and not skyward. For sure you are edging too long before popping up. Don’t wait for the kite to pull, just change your hands and pop. If you still couldn’t get enough height. Make sure that you start with the kite positioned as near to 12 o’clock as you could. You should hurl the kite up before you unhook. If you bounce off the back of the board when you land. You are not getting your feet forward enough as you rotate. Always bring your knees all the way through and up. If you can’t reach for the bar. Make sure you pull the bar down towards you and keep your arms bent all through the loop. Finally, you’ll need to pass out the wrapped nice and quick; otherwise the kite will just continue to loop around. Bring hands and back knee together when you feel the power coming. The front loop from toe side is an extra bit of fun for anyone who wants themselves as proficient toe combo specialists. It is a very attainable move and can lead into a surplus of combos and tricks, both hooked and unhooked, so this is a must have for any promising crowd pleasers around you. As you start from your toes, you’ll find that the kite does a lot of work for you when it comes to spinning. As long as you get the take-off and you keep controlling the kite’s atmosphere, it will be a well aligned move. Pic A – The surfer is edging against the kite. Not wanting to draw too much attention to it, but this is another classic kite face trick. If you thought edging upwind requires some effort, now you will edge upwind and try to keep your weight low against the lift of the kite, you will need to use all your steel on it. For starters, trim your bar down towards you. With the bar nearer your body, you will be able to edge well with both hands on the bar, thus being able to send the kite and keep the control on it. Even though the surfer’s bar is angled back to send the kite, the front arm is still bent slightly, so the kite doesn’t pull the surfer around. You can see how the surfer has his neck twisted and face really looking over his shoulder and down. This allows the surfer to commit against the kite and keep the body weight low and forward, whilst still keeping both hands on the bar. This way the surfer is able to hold the edge for that a little bit longer. Just like with a heel side jump move. If the surfer has a cheeky peek at the kite, it will come off the edge. Pic B – Demonstrated the take-off perfectly. The surfer has popped up off the water after the feeling of the rising kite has been felt. Even though you use the kite for this trick, you need to “go early” because you’ll not be able to resist the same way that you do on your heels. Even though the surfer is extending up, keep the head down and twisted around plus continue to commit the weight upwind against the pull of the kite. It is tempting to drift the kite up slowly, but if you are fairly aggressive, you have more chance of holding your edge until the right time. This is your only chance to give yourself enough height to complete the move. Also, as the surfer starts to take-off, the bar levels have been off already. This is due to popping up early. As the surfer essentially loses the edge as the pop goes, the kite will fly further back as the surfer pendulum underneath it. Once again this is only possible because the surfer has the bar trimmed in near. 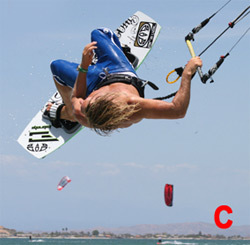 Pic C – The final part of the surfer’s take-off is the initiation of his forward rotation. Just as with a heel side front loop, much of the momentum comes from the back leg kicking off the water, and as the surfer popped off, his back leg will help in that phase. If you look at the surfer’s head, it is no longer looking upwind over his shoulder. By turning his head to look forward and downwind, his body will automatically start to uncoil, and this is a further help by the kite pulling in the harness hook. From here onwards it is all about keeping the bar in and keeping the kite forward while getting your body tucked up and small, so that you can look over your back shoulder and complete the rotation. 1-2. With his kite at 1 o’clock and riding with good speed on his toe, the surfer edges hard and sends his kite back for a jump whilst trying to look upwind. 3. As the kite starts to lift up, the surfer explodes up off his back leg whilst committing his weight upwind and of the board. 4. As the surfer kicks off, turns his head and looks downwind under the bar. At this point the surfer is already redirecting the kite forward with his front hand. 5. 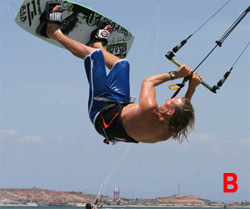 This impulse coupled with the pulling of the kite, the harness throws the surfer into a front rotation. You can see how the surfer is pulling hard on his front hand. 6. This looks familiar. The surfer is now facing upwind and it looks exactly like a normal front loop. The surfer has the bar pulled in to keep the tension on the lines, the surfer is looking over his back (left) shoulder to continue rotating combing with his knees pulled up to increase the speed of the rotation. 7-8. The surfer keeps looking over his shoulder in an effort to see the water and where to land. 9. As the surfer completes his rotation. The surfer dives the kite hard with his front hand and focuses on his landing. 10. The diving kite pulls the surfer off downwind and stops his rotation. Now the surfer can drop his feet and is ready for the landing stage. 11. The surfer lands tail first with his board pointing downwind for a clean landing. From here the surfer can gather his thoughts before carving back onto his edge and not spinning his bar. It’s always good when you have the chance to learn something that looks exquisite; the hooked in Popped Front Loop is such a cherub. Even when it is too windy to show off all the technical tricks in your armory, this adds up with a cheeky Indy Grab that will keep most of the pop fanatics happy. It is a great way to get your head around an unhooked popped front and it is a welcome alternative to a sent jump front. It will work on the flat off a wave and because you can control the power in the kite, even the chop won’t stop you. The essence of any pop trick is that all your upward force comes from you alone, with no help from the kite. However the position of your kite will affect how much height you get. The nearer it is to 12 o’ clock the more lift you will have. So it stands to a reason that if you are learning this move, you should have the kite around 11 o’clock. This way the kite will be just low enough that you can edge against, but it will also be high enough to give you some bonus lift and assist with getting your board back under you. 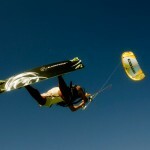 As you won’t be using the kite for the lift, you will need some quickness and speed so you can pop hard. Assuming that you popped, you will already know that generating your speed can be increased by heading slightly off the wind with the power of your kite. Just try and change your direction smoothly by steering the board in front rather than standing up on it. 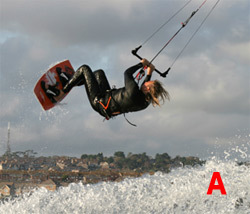 Pic A – Shows that the surfer is in a perfect pre-pop position. The kite is on 11 o’clock direction and has steered the surfer’s board off the wind by the feet’s extension. To maintain a good stance, you need to push your front leg out and move your hips back behind your back foot. 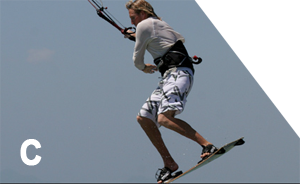 Your shoulders should be still behind your hips and the board is still in between you and the kite. Keep your hands on the center of the bar to prevent any unwanted kite movement. Here you can acquire speed that will give you an attempt to carve back onto your edge. This isn’t the moment to consider on as in reality it only lasts a split second. However your body position here is the important thing because it defines the amount of pop that you will get. Visualizing it first and foremost can be of benefit. 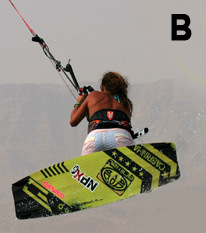 Pic B – Best Place to start is the surfer’s kite face. To get a decent pop and enough rotation, you need a bit of an effort and aggression to go up. Next see how close the surfer has his derriere to the sea. This is only possible because of the position taken into the pop. With the surfer’s weight back and upwind, it is easy enough to get back on the edge by turning suddenly on upwind. Using your shoulders to twist your body around your hips for the board turn can give you a quick flexibility for the move. See that the back leg of the surfer is flexed and ready to extend, and the front leg extension keeps the surfer’s board on edge. As soon as you get into the position, you must be ready to pop up or else you will lose speed. Final point here is not to pull on the back hand. As you know from a front loop, the take-off is everything as it initiates the rotation. It also needs to give you pop so the trick is to fire yourself into the rotation without flattening the board off. Pic C – shows that the surfer explodes for the take-off. You can see how the back leg extends against the resistance of the edge of the board, thus pushing the body up. However unlike a sent front loop, it doesn’t throw across the board towards the sea on the other side, as this would flatten the board. Instead the surfer throws his head towards the nose of the board allowing a bend sideways at the waist. This stage is enough to start the rotation. Faith is the key. Pic D – Clearly demonstrates the commitment to the pop. As the surfer goes up, bar-in is the one you should keep in mind because if you do so, rotation can be easy in middle lines. See the surfer’s front hand as his steering connection slows down the kite to make sure it doesn’t drift up. The surfer is now in a textbook position to throw the rotation. With your back leg extended and front leg bent combined with your weight down, your next step is to forward now to speed up your rotation and turn your head to look back over your trailing shoulder and bend your back leg. It is highly recommended practicing kiting across the wind with a speed before bearing away and then turning up again to concentrate on your body position. Once you have done this a few times, just add the pop off the back leg and you will find that popping hard with your front shoulder is actually easy. If you lose balance, most likely you are not bearing away enough before carving hard. The more downwind you start the less far you have to rotate. 1-2. Notice the surfer keeps the bar in close, keeps the kite steered forward and throws his head and shoulders down towards the nose of the board. Now that the board is clearly off the water, the surfer needs to rotate faster. 3. The surfer quickly turns the head to look back over his rear shoulder. 4-5. As long as the surfer keeps the bar the kite steered forward while he keeps looking over the shoulder, the rotating will continue to go. 6. Once the surfer can see the water, the concentration will be on where to land. 7-8. As the surfer’s leg comes around, the extension of the legs should be ready for landing. Aiming to land the tail first, pointing downwind on a flat board and not on the edge the surfer carries a fair amount of speed. As long as the tail lands first, the board can pivot further around and downwind. 9. The surfer lands, absorbs the impact and keeps head up looking where to go with balance in hand. The surfer has the bar in and the kite steered forward always. Here´s what it will look like! Recommended sites: F-One Kites | Royal Kites.